Apr. 12, 2013 6:00 p.m.
Nestled among trees approximately 20 kilometres south-east of Wetaskiwin is the Angus Ridge Community Hall. The first impression when driving up to the hall is that it is neat, tidy and has been well maintained. Upon entering the Hall, it becomes very evident the people of the region take a great deal of pride in this facility. And it is going to get better. 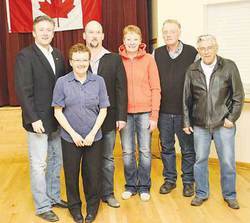 MP Blaine Calkins visited the community on April 2nd and presented a $14,000 grant for infrastructure upgrades. Having a well maintained and active rural community hall is becoming a thing of the past as rural populations have declined. It was just over 100 years ago that farmers cleared their land and planted their crops either by hand or with the help of horses. That was when there was a house, barn and other buildings on almost every quarter section of land. With the outbreak of WWII there was an increased demand for farm products. Farming practices became more modern with increased mechanization and began the trend to more specialized, larger farming operations. Small farms were bought up and gradually disappeared until today, where large industrial farms will be seeding thousands of acres of land using millions of dollars of equipment. Today, the rural landscape is a graveyard of decaying buildings and rusting equipment. Communities as we once knew them have pretty much vanished. It’s sad to see the churches and schools, once the hub of rural communities, become the victims of time and neglect and deteriorating or demolished. Improved transportation and roads have expanded the boundaries of communities as residents travel further and further to seek and support activities and entertainment. Neighbors are less likely to help neighbours and know less about their activities. Improved roads enable an ever increasing number of vehicles driven by strangers to pass through rural communities. Most of the early settlers have passed away while their children and grandchildren and even great grandchildren have chosen to live in urban centres. The Building Canada Fund (BCF) continues to invest $8.8 billion nationally in infrastructure projects by targeting the unique challenges of local and regional communities, while advancing national priorities important to all Canadians – a stronger economy, a cleaner environment and stronger, more prosperous communities. The application deadline has passed for the Building Canada Fund (BCF) in Alberta, Manitoba and Saskatchewan and no new applications are being accepted in these provinces. The $1 billion Municipal Rural Infrastructure Fund (MRIF) makes strategic investments to improve and increase the stock of core public infrastructure in areas such as water, wastewater, culture and recreation. At least 80% of MRIF funding is earmarked for municipalities with populations of less than 250,000. The application deadline has passed for the Municipal Rural Infrastructure Fund (MRIF) and no new applications are being accepted. Projects approved under MRIF must be completed by March 31, 2013. While the application process has closed, WD continues to invest $276.4 million in Western Canada through the MRIF.